Real GDP (a measure of economic growth) has been increasing since 2009 from the most recent low of $363 billion. It has been growing since then and is at a high of $440 billion in 2018. Private-sector employers have added 600,000 jobs since 2010, the national low point for private-sector employment. From 2017 to 2018 the private sector has added approximately 50,000 net new jobs, putting it above the pre-recession high of 3,600,000 total jobs but below the 2000 high of 4,000,000. Average hourly wages in the private sector have been slowly increasing since 2007, going from $20.75/hr to $25/hr in 2018. Manufacturing employment has been declining since 2001, especially during the 2008 recession, but has been growing slightly since then. There are currently 610,000 jobs in this sector in 2018, down from 990,000 in 2001. Average hourly wages of production employees have been decreasing since 2008, going from approximately $22.50/hr in 2010 to $21/hr in 2010. There were 123,000 jobs in the Transportation and Warehousing sector in 2018, 35,000 jobs above its 2010 low, showing a recovery in this sector. The average wage in the Transportation and Material Moving occupations was $17/hr in 2018. The unemployment rate in 2018 is 4.9%, the same as the year before. This is above the national average of 3.9% unemployment. The House Price Index, a measure of the cost of housing, a measure of the cost of housing, declined since its 2005 high of 320. It has been increasing since 2012, hitting 325 in 2018, showing growing housing costs. 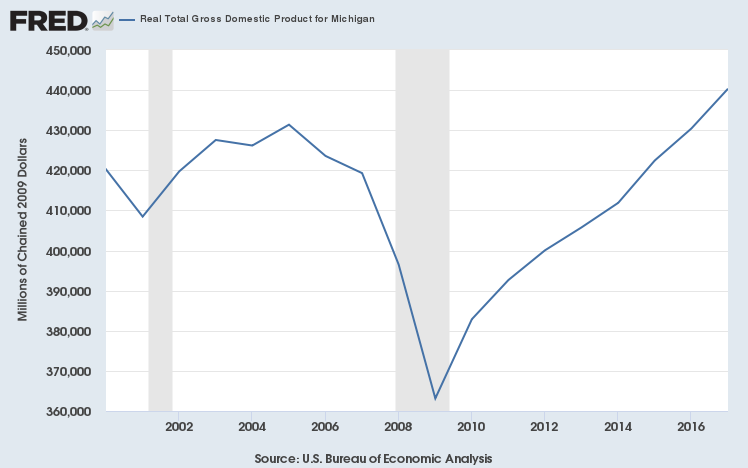 Real GDP (a measure of economic growth) has been increasing since 2009 from the most recent low of $186 billion. It has been growing since then and is at a high of $223 billion in 2018. Private-sector employers have added 330,000 jobs since 2010, the national low point for private-sector employment. From 2017 to 2018 the private sector has added approximately 17,000 net new jobs, putting it above the pre-recession high of 1,800,000 total jobs but below the 2000 high of 1,900,000. Average hourly wages in the private sector have been slowly increasing since 2011, going from $22.50/hr to $27.60/hr in 2018. Manufacturing employment has been declining since 2000, especially during the 2008 recession, but has been growing slightly since then. There are 250,000 jobs in this sector in 2018, down from 380,000 in 2001. Average hourly wages of production employees have been decreasing since 2008, going from approximately $25/hr in 2010 to $23/hr in 2018. There were 65,000 jobs in the Transportation and Warehousing sector in 2018, 19,000 jobs above its 2010 low, showing a recovery in this sector. The average wage in the Transportation and Material Moving occupations was $17.78/hr in 2018. The unemployment rate in 2018 is 3.25%, down from the prior year’s 5% rate. This is below the national average of 3.9% unemployment. The Consumer Price Index for Housing declined since its 2006 high of 190. It has been increasing since 2011, hitting 220 in 2018, showing growth.